I’ve come to discover that plums are one of my favorite fruits. I love their tartness, texture and amazing color. A jammy plum compote is an irresistible treat over ice cream or yogurt, a stupor-inducing accompaniment to anything ginger, an incredibly soothing comfort slathered over toast or fresh-from-the-oven scones. Since I found myself with a bowl of perfectly ripe plums, I wanted to make something creamy and comforting to go along with a beautiful plum compote. I decided to make a Russian Cream. Creams are one of the basic building blocks of pastry. Pastry Cream is an egg custard thickened with starch and sometimes lightened with a bit of whipped cream or Italian meringue, which makes it a chiboust. Bavarian Cream is typically a crème anglaise custard lightened with whipped cream and set with gelatin so it can be sliced. Mousse is a base of cream, chocolate or fruit that is lightened with whipped cream or egg whites and sometimes set with gelatin. 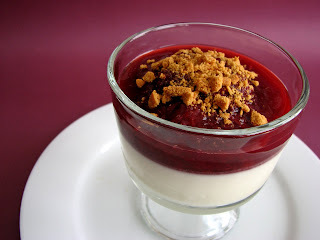 Panna Cotta is a cooked eggless cream also set with gelatin. Russian Cream happens to be a riff on panna cotta. It differs only slightly because it has sour cream as a basic ingredient. However these days we are seeing lots of panna cotta mixed with varying quantities of buttermilk, sour cream or crème fraiche. 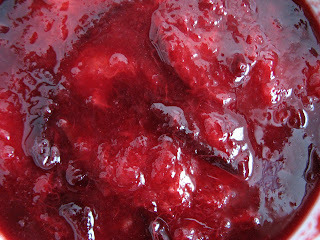 The delicious plum compote comes together very quickly and will keep for a couple of days in your refrigerator. The color of it looks stunning over the snow white cream. As we drift into fall, we still have some lovely end of season fruit to linger over before we go into a long spell of holiday pastries and desserts and all that entails. Spices, nuts, chocolate will soon fill our kitchens along with pears and apples and a host of dried fruits. But for now, there’s still time to enjoy the last of the peaches, nectarines, plums and other gorgeous fresh fruit. Time for a run to market. - Make sure your plums are nice and ripe. Cook them gently over low heat to preserve the flavor. Taste for sugar and adjust if necessary. Add enough lemon juice to brighten and balance the fruit. Bloom the gelatin by sprinkling over the cold water and let sit for 5 minutes. Combine cream and sugar in a saucepan. Bring to a simmer over low heat until the sugar dissolves. Remove from heat. Heat the gelatin over a bain marie until it dissolves. Whisk the gelatin into the whipping cream mixture and combine with sour cream, vanilla and lemon juice until smooth. Pour into a bowl or parfait dessert glasses. Cover and chill for about an hour or until it sets up. Slice each of the plums into 6 pieces. Cook the plums and sugar over low heat until soft and juicy. Remove from heat and add lemon juice to taste. Cool. 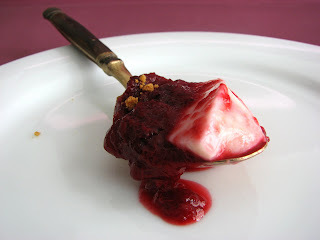 Top the Russian Cream with plum compote and garnish with gingersnap cookie crumbs. I do love plums, but don't use them as much as I should...thanks for a great excuse to incorporate them into my dessert world more often! i love plums, too! the color you have here is beautiful, i love the picture with the spoon. i've never heard of russian cream! you always come up with the coolest stuff!! I have also never heard of Russian cream, but it sounds wonderful. I like the addition of sour cream. 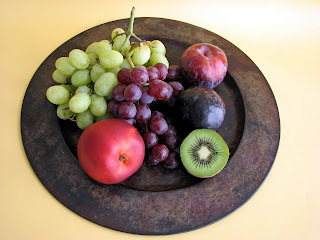 this looks delicious gayle... and the color... those plums! divine! I just love your blog! I've actually been reading it for a while, but I wanted to let you know that I've added you to my sidebar! This looks so delicious and elegant! I love plums too - I have to try this recipe!! I found your web page from stumbleupon.com... Such a discovery to me! I simply fell in love with this blog. I love the color of plums too (as I noted in my galette post:) ) I love your dessert - the white makes such a beautiful contrast to the purple! This is too beautiful to imagine eating! Happy to see the plums, one of my favorites, and not used often enough. Looks very heavenly. Would like to try some for myself.